Dan and Michael have a long history of creating original performance pieces – incorporating movement, text, visual art and music – “Performance Art Musicals.” Much of this work was created to give expression to their identities as proud, loving, gay men. Selected projects: Two Men Dancing (with Ishmael Houston-Jones, 1976 – 1980), How I Spent My Summer Vacation (1983), Xposed (1984), Homo Love Song (1990), Human Being (1992), Sanctuary (with choreographer Jim Self, 1993), Aria (with choreographer Matthew Neenan, 1998), and Claire (with choreographer Melanie Stewart, 1996 and 2007). In 2010 they were commissioned by Philadelphia Dance Projects to restage some of their early works on a new generation of performers. Productions in New York include HERE, the Serious Fun Festival at Lincoln Center, The TWEED Festival, BAX, Danspace, and PS 122, among many others; in Philadelphia at The Hal Prince Theatre, the Painted Bride, The Arts Bank, The Walnut Street Theatre 5, and The Performance Garage among others; and in many US cities and universities. The Dance (1992) – a short documentary film about Michael and Dan and their creative work has been screened worldwide and is in the permanent collection of MoMA. 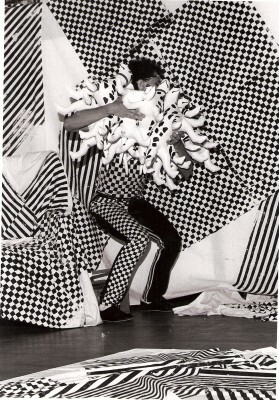 Film/Video excerpts of Michael & Dan’s performance art pieces 1983 – 1993. Including Ugly Face, How I Spent My Summer Vacation, Homo Love Song, Into the Light, The Dance. Short film of the rehearsal process and performance of a love duet for two men Martin & Biello wrote for the Pennsylvania Ballet’s Shut Up and Dance benefit concert in 1998 – with choreography by Matthew Neenan. Italian translation by Louise Pandolfi. Performance by Dan & Michael – a song from Homo Love Song – live at the Brooklyn Arts Exchange (BAX). Watch this 2010 remounting of Biello Martin’s early stage work He & He. Watch this music video created for Biello Martin’s musical Xposed. Winner of the Best Short Award at the 1985 San Francisco Lesbian & Gay Video Festival. A satire of the early 1980’s gay male dating scene. This is a short documentary film about the history of dance/theater artists working in Philadelphia in the late 1970’s and early 1980’s – a glimpse into Biello Martin’s pre-musical theater work when they began discovering and creating “performance art musicals”. The other artists featured in the film are Jano Cohen, Terry Fox, and Ishmael Houston-Jones. The film is by Carmella Vassor Johnson. In 2010 Philadelphia Dance Projects commissioned Dan and Michael to re-envision and re-stage several of these works using young local dancers.